The Soul Immigrants look set to stir up the UK soul/funk scene with the release of their new album The Hustle Is On. Formed in 1992, The Soul Immigrants are a British soul/funk group hailing from South London. The band has already amassed a steady stream of dedicated followers in the UK, Germany and Japan, bedazzling fans with their potent blend of funk, soul and jazz. The six piece group have performed at Glastonbury, as well as at Jazz Cafe and the Craig Charles Funk & Soul Show and also opened for US3 on their recent European tour. 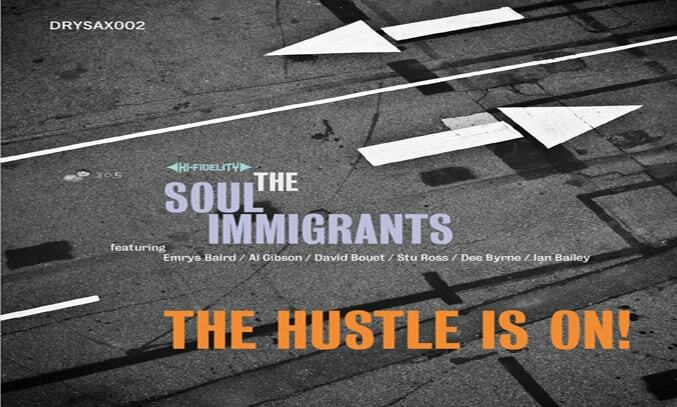 The Hustle Is On is the first album by The Soul Immigrants since they reformed in 2011. Funky, soulful and incredibly catchy, the album boasts a repertoire of songs inspired by old soul-funk classics, Latin grooves and afrobeat vibes. The album opens with Yard of Hard, an epic funk track featuring American jazz and funk trombonist Fred Wesley and fabulous high pitched vocals from frontman Emrys Baird. Retro dance track The Hustle Is On swiftly follows, keeping the tempo up high with its deep funk grooves and a fabulous jazz/funk sax solo. If you like luscious Latin grooves, Golden Summer Rays is worth a listen with its trippy 70s vocals and punchy horn section. The playful Why Don’t You Funk Me (Like You Used To)? also appeals with its catchy lyrics and superb trombone solo. The tempo slows for Projects with its soulful blend of jazz and groove and Shoot’s Lament, a laidback and intelligent soul/jazz track, before rising back up for the distinctive Sweet Beat with its twangy telecaster guitar grooves and the feel-good Pressure Point with its catchy lyrics, punchy horns and all-round funky vibe. The highlight of the album is arguably the two bonus tracks originally released a 45RPM singles. The afro-funk Sunk Without The Funk is sure to get you moving with its fast and funky beat and soulful melody. The acid jazz The Ghetto (There’s No Way Out) is equally good with its afrobeat vibe. If you like your horns horny and your guitars groovy, The Hustle Is On by The Soul Immigrants is the album for you.